Monday Evenings at Station Road Starting in May 7pm - 8.30pm followed by drinks! Not getting any younger but still think you've got what it takes to mix it out on the park? ...if you're over 35 then Masters is just what you need! Masters rugby league is open to anyone aged 35+ and is the perfect way to keep yourself involved with the team spirit and social aspects of playing rugby. Our masters players play adhoc games and tournaments and often train with the first or reserve team players. All players must be over 35 and retired from competitive rugby league. Masters Rugby League started in New Zealand in 1992 and progressed to Australia, enjoying great success and is currently engaging thousands of players. 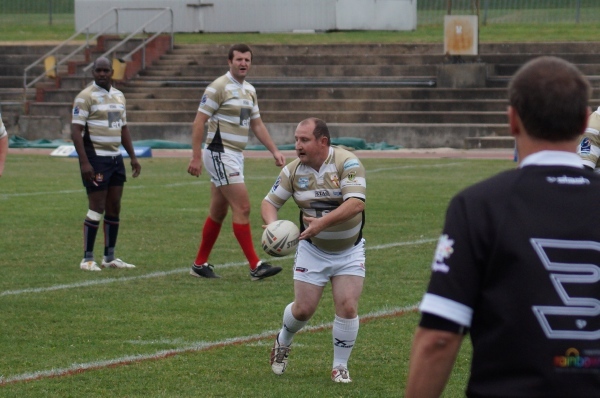 Masters Rugby League can only be played by persons aged 35 or over, is strictly a social version of the sport and the rules are slightly modified to cater for the older player. There are no winners, no champions and no cup finals. It is all in the spirit of the game rather than proving a point or settling a score. “Everyone has to buy a drink for their opposite number”. Different coloured shorts for different age groups and the rules, plus players awareness during the game, are adapted accordingly. - Red short players must be physically stopped and held. No more than 2 players allowed in any tackle and no fending/hand-offs. Once progress has stopped, players are preferred to succumb. Rough and over vigorous play is not condoned; safety (to old bones) is paramount. Passive scrums happen after nearly all infringements and turnovers. 1 marker and dummy half/acting half back must pass. Kicks only allowed on the last tackle. 25 minutes each way with unlimited interchange. Fixtures will be played from May-August.